Mercer County records of birth, death, and marriage (1917 on) may be purchased for about $12 by immediate family from the Health Statistics Center. For vital records older than 1917, see the Mercer County Clerk. Public records, with few exceptions, include birth records older than 100 years and death, marriage, and divorce records older than 50 years. 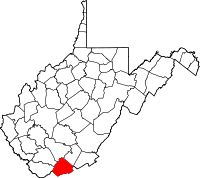 Created in 1837 from Giles and Tazewell Counties in Virginia, Mercer County was named for Scottish immigrant Brigadier-General Hugh Mercer, a surgeon in the American Revolution, which claimed his life. In 1862, during the Civil War, Confederates in retreat set fire to the courthouse in Princeton, decimating the town.